David (Dave) 'The Hammer' Schultz (born October 14, 1949 in Waldheim, Saskatchewan) is a former National Hockey League ice hockey player. During his playing career Schultz earned the nickname "The Hammer" for his aggressive style of hockey. He was one of the most notable enforcers on the Philadelphia Flyers' infamous "Broad Street Bullies". After winning two Stanley Cups with the Flyers (1973-74 and 1974-75), the Hammer drifted through several teams (Pittsburgh Penguins, Los Angeles Kings and Buffalo Sabres), looking for a permanent position. When different GMs tried to find some muscle for their fledging clubs, Dave was a popular number to call. Schultz was not just an enforcer in the traditional sense as he scored 20 goals for Philadelphia in 1973-74. He also scored the series clinching goal in overtime in the first round of the 1974 Stanley Cup Playoffs against the Atlanta Flames. Schultz epitomizes the "hockey tough guy" and is renowned as one of hockey's greatest enforcers. Many interesting stories exist from Dave's playing days. Towards the end of Tim Horton's career, Schultz attempted, at age 25, to pick a fight with the 44-year-old Horton, who was much smaller (5'9" and 190 pounds) and known for a more gentlemanly style of enforcing (he never got more than 150 penalty minutes in a season his entire career, even though he was famous for powerful hits). Horton initially refused to fight, but eventually accepted after repeated confrontations, where he defeated the younger and stronger man handily by throwing him to the ice and sitting on him until the referee ended the fight. After injuring his wrist in a fight, Schultz once put boxing wraps on his hands for protection. As things usually went, Dave had several fights in ensuing games, while wearing the wraps. However, soon after, enforcers in both the NHL and WHA started wearing similar hand protection. This was not to protect an already injured hand/wrist, but to prevent themselves from injury in a fight. Soon after, this trick became popular, both the WHA and NHL passed what became known as the "Schultz Rule" - thus, banning the boxing wraps short lived career in professional ice hockey. The Hammer was born in Western Canada on October 14, 1949 - Waldheim, Saskatchewan. He was selected in the 5th round, 52nd overall in the 1969 NHL amateur entry draft by the Philadelphia Flyers. Schultz played one season in the Eastern Hockey League in Roanoke, Virginia for the Salem Rebels. He played two seasons in the American Hockey League in Quebec City with the Quebec Aces, and only one season with the Richmond Robins in Richmond, Virginia before moving to Philadelphia. 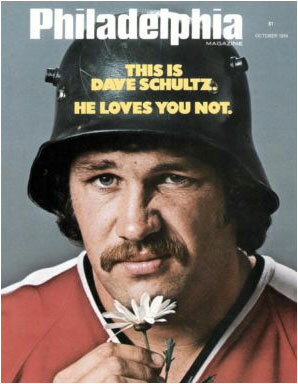 During his eight years in the NHL, Dave Schultz was one of the most feared enforcers the game has ever known. Nicknamed "The Hammer," Schultz became a regular with the Philadelphia Flyers in the fall of 1972. Almost immediately it was clear that hockey had never seen anything like Schultz. As a rookie in 1972-1973, he led the league with 259 penalty minutes. He set the NHL's single season record for penalty minutes with 472 in 1974-1975, a record that still stands today. Schultz was always lightening-quick to defend a teammate in need. His message was ever clear: You mess with one Flyer, you mess with us all. Schultz was happy to hand down sentencing on the spot. That message echoes today, perhaps not as loud, but it remains an integral part of the fabric of Philadelphia sports and NHL History. Schultz's on-ice persona not only pushed other teams into submission through intimidation and brute force but also pushed the uncharted boundaries of the NHL. Dave Schultz also played for the Los Angeles Kings, Pittsburgh Penguins, and the Buffalo Sabres. When Schultz hung up his skates, he had won two Stanley Cups and countless hours in the penalty box but more importantly, Schultz had changed the landscape of hockey and likewise helped transform a iron-strong bond with Flyers fans who still embrace the organization and the man some 30 years later. Dave has been public speaking for more than 20 years. Having been a member of 2 Stanley Cup Championship teams, current president of the Flyers Alumni Association, ACHL League commissioner, General Manager/Head Coach in both the ECHL and UHL, an entrepreneur, father, and commentator, Dave loves to share his unique perspective on life, sports and team relations.,specializing in public/motivational speaking, corporate spokesperson/ representation,I have known dave for over 20 years and when you talk about old school hockey he is the Best! A fan favorite and has become one of the most popular speakers in Philadelphia. To receive more information or get a quote email us and we will get back to you as soon as possible. Kevin Curtis joins Terry Bender Promotions.